It’s been moving to watch the response in China to the July 11 death of renowned scholar, Ji Xianlin (1911-2009). While Ji’s unsurprising departure at the ripe old age of 98 has not brought quite the same flood tide of emotion and cultural stock taking in China as Michael Jackson’s completely unexpected death a few weeks earlier at age 50 has in the United States and around the world, the way the venerable scholar is being remembered in Beijing is nevertheless remarkable. 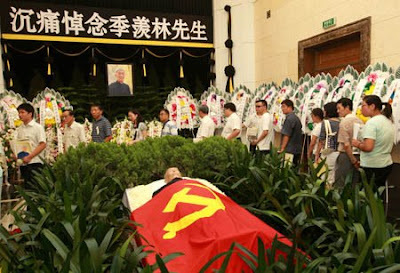 Long lines of people wishing to pay their last respects waited for hours to gain entrance to a memorial ceremony held on the Beijing University campus where Ji taught, the press was full of tributes, and Communist Party leaders were very public in the honors they paid to the man from academe. In the United States it is hard to imagine the death of an elderly scholar, of a humanist who worked on the ancient past no less, ever attracting anything approaching the level of attention that Ji’s passing has in China. Ji Xianlin and Michael Jackson shared nothing in common except the coincidence of the timing of their deaths and the fact that in passing both were mourned as departed cultural symbols. Frankly, as the hysteria over Michael Jackson’s death has continued to pulsate through American society I have found it refreshing to follow the treatment that Ji Xianlin’s high-minded life has received in China. I feel this way even though it’s clear that the Chinese Communist Party’s highly public paeans to the deceased scholar have not been free of political considerations and while also acknowledging that Michael Jackson’s life and career certainly merit serious reflection and social commentary. Still, when looking at the way Ji’s death has been treated as compared with Jackson’s, and at what the two cultural symbols meant to their times and places, I find myself more drawn to the values and maturity on display in China than to the self-referential, entertainer-obsessed conversation that Jackson’s death has occasioned in the United States (even if much of that conversation has been about the sadness and oddity of Jackson’s life). Ji Xianlin was without doubt an outstanding scholar whose career was noteworthy for its singular achievements and cosmopolitan dimensions. Originally a student of Western literature at Qinghua University, in 1935 Ji traveled to Germany for foreign study. At the University of Göttingen he moved in a dramatically new direction, choosing to major in Sanskrit and other ancient Indian languages under the direction of Ernst Waldschmidt and Emil Sieg. Ji received his Ph.D. in Germany and after World War II returned to China where he took a position at Beijing University and founded the Department of Eastern Languages. He chaired that department for the next three decades and built it into one of the most important academic departments at Beida and China’s premier center for the study of Eastern languages. Ji’s greatest scholarly accomplishments came in the realm of the history of Indian Buddhism and comparative linguistics. According to his former student Zhang Baosheng, now a professor in the Department of Foreign Languages at Beijing University, Ji’s academic achievements represented the next wave of greatness within the long, proud tradition of Chinese evidential scholarship after the great contribution made by Ji’s patron, the celebrated historian Chen Yinke, who helped bring Ji to Beida in the first place. Whereas Chen Yinke used literary works as a means of verifying history, Ji Xianlin pioneered a method of using comparative linguistics to verify historical events and to track changes over time. Ji’s scholarly findings attracted international attention and made him a world leader in his field; over the course of his career he was awarded major academic prizes in India, Iran and Japan. In addition to pioneering new methodologies and creating new knowledge, Ji Xianlin also held important administrative positions in the later part of his life. Following the Cultural Revolution he was called upon to help re-build major Chinese academic institutions ravaged over the previous decade. In 1978 he became vice president of Beijing University (which position he held until 1984) and also director of the Chinese Academy of Social Sciences’ South Asia Research Institute. During his career he also served as chairman of various professional organizations, such as the Chinese Foreign Literature Association, the Chinese South Asian Association, and the Chinese Language Society. Ji Xianlin’s achievements within academe distinguish him as one of the towering humanistic scholars of the Chinese twentieth century, as an intellectual whose name deserves to be mentioned, as it was again in a tribute piece recently published in Beijing, along with luminaries such as Chen Duxiu, Chen Yinke, Hu Shi, Li Dazhao, Liang Qichao, Lu Xun, Wang Guowei, and Zhao Yuanren. 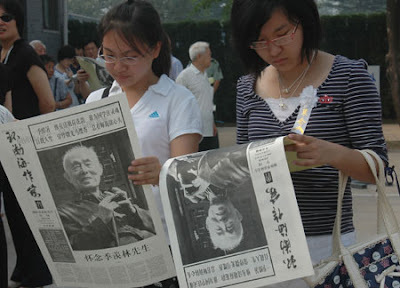 But Ji’s career, centered as it was in the esoteric academic field of Indology, which few people understand or appreciate, cannot account for the long lines of people wishing to pay their last respects at Beijing University nor for the tributes that poured in from highly placed people within the academic, publishing and cultural spheres upon news of his death. 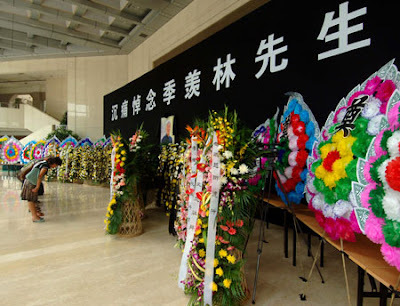 Likewise, Ji’s scholarly accomplishments and official positions at key academic institutions do not explain why the Chinese press has carried so much discussion of the scholar’s life, why Communist Party leaders Hu Jintao, Jiang Zemin, Wu Bangguo and Xi Jinping sent flower wreathes and offered condolences upon news of his death, or finally why, on July 19, his corpse draped in the red flag of the People’s Republic (Ji joined the party in 1956) and laid out for a final viewing, other top officials, including Wen Jiabao, Jia Qinglin, Li Chanchun, and Li Keqiang, showed up to make their farewells in person. To understand why Ji Xianlin’s passing has struck such a chord it is necessary, I believe, to recognize that in his later years he had become a living symbol of the ideal Chinese scholar, and as such of a type of person who it is ever more difficult to find in today’s fast-paced, money-crazed Chinese society. Here was a man who had been born and raised in the old society, who knew the classics, who had attainted great fame and yet who did not attempt to convert his glory into power, wealth, or celebrity, who in fact talked down his achievements and continued to work hard at his research as long as he was able. Ji was not first and foremost a Confucian philosopher but he nevertheless came to be seen as a kind of secular Confucian sage who personified the committed life of the scholar. His integrity and wisdom, then, not his outstanding scholarly achievements, led to his being recognized as a “national treasure” (国宝), though he himself rejected such a label. While the world around him buzzed first with Maoist revolutionary fervor and then with Western-style modernization, Ji Xianlin, identified with the secluded garden campus that is Beijing University, remained committed to his study of the ancient, non-Western past. He devoted his life not to the practical but to historical discovery, and in so doing was adamant in claiming that civilizational values other than those associated with the modern West deserve to be known, celebrated, and even selectively embraced as humanity collectively makes its way forward in time. The steadiness of conviction that informed Ji Xianlin’s life, and the messages he derived from his life’s work, proved highly reassuring during a period of unceasing and disorienting change. In his humility and seriousness of purpose it is hard to imagine a greater contrast to Michael Jackson, the fallen American cultural symbol. Whereas Jackson forever reinvented himself and never ceased turning his life into spectacle, Ji occupied a well-established scholarly role with grace and distinction. Jackson was all artifice, Ji not the least bit affected. Jackson appears never to have known who he was, Ji to have possessed a remarkable inner compass and knowledge of self. The scholar lived simply, dressed in the clothes of a common worker, and was available, kind and respectful to one and all, regardless of social station. As those themes come up again and again in the articles that appeared after Ji Xianlin’s death I sense in them a nostalgia for the ideal of a life defined by the quest for pure knowledge and self improvement, for an age when those ideals were aspired to by society’s best and brightest. For Chinese intellectuals Ji Xianlin meant more still. To them he was a hero who used (and so risked) his reputation to speak out on issues of concern to all. Like most of his colleagues, Ji suffered during the Cultural Revolution. Nevertheless, during that period he secretly worked to produce a brilliant Chinese-language translation of the Ramayana from the original Sanskrit, an act of bravery and scholarly devotion for which he later became celebrated. When after the Cultural Revolution he was named to high administrative posts at Beijing University and the Chinese Academy of Social Sciences he became one of the great survivors of the age and a symbol of the indomitable spirit of truth-seeking Chinese intellectuals. In the mid-1980s Ji Xianlin added to that reputation when he published an essay calling for a new and more favorable appraisal of Hu Shi, who of course had been vilified during the Cultural Revolution. Ji’s point was that whatever Hu’s political mistakes, his contributions to the study of Chinese literature stood on their own and needed to be recognized. Not everything should be politicized, Ji maintained, a message that was widely praised within Chinese intellectual circles at the time. 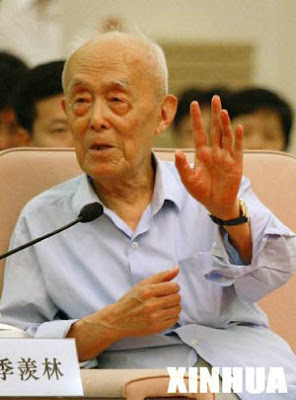 In the late 1990s, with the publication of his widely read and highly acclaimed account of his own experience during the Cultural Revolution, Memoirs from the Cowshed (牛棚杂亿), Ji’s reputation for speaking the truth in a courageous and thoughtful manner was deepened still further. While it is impossible to know with certainty, it would seem that the Communist Party lavished so much praise on Ji Xianlin upon his death not only because many of its top leaders recognized his scholarly achievements and admired him personally (Wen Jiabao is even said to have referred to Ji as his mentor) but also because in embracing him and what he stood for they were able to communicate to Chinese intellectuals on the eve of the all-important Sixtieth Anniversary of the founding of the People’s Republic of China that they share heroes in common, that they speak a common language. Unlike American political leaders, most of whom do not feel compelled to demonstrate any cultural competency whatsoever, top political leaders in China desire to be taken seriously by intellectuals and to display to the public at large that they are not only working to protect and strengthen the country but also that they prize the scholarly custodians of the Chinese past. Culture, history and politics are intertwined. So to bind Ji Xianlin to the political leadership in a clear way, the party press went out of its way to identify Ji as a great Chinese patriot, as a figure who dedicated his life to his people and to his country’s improvement. In these ways it was useful for the Communist Party and its official media organs to mark Ji’s passing and to extol his virtues. Finally, Ji Xianlin happened to pass at the very moment when the sad and murderous recent ethnic violence in Xinjiang was filling the media in China and around the world. 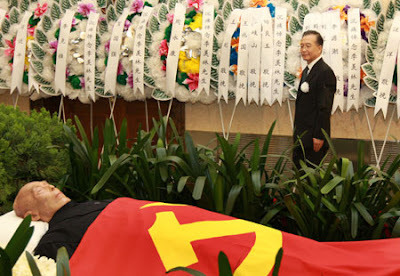 As the fractiousness of contemporary Chinese society, at least one part of it, was on display and impossible to deny (even if its causes will long be debated), and as Party leaders scrambled to contain the damage, an orderly period of mourning for a great man, a great Communist with popular appeal, was an attractive possibility. And here Ji Xianlin’s worldview and unique scholarly contributions proved particularly meaningful, for one of the things that Ji stood for most powerfully was the idea that, to quote Ji himself: “Cultural exchange is the main driv[ing force] for humankind's progress. Only by learning from each other's strong points to make up for shortcomings can people constantly progress, the ultimate target of which is to achieve a kind of Great Harmony.” Not only should the Chinese people admire Ji Xianlin for his great scholarly achievements and his integrity, the official obituaries seemed to suggest, they should also realize that he stood for cultural tolerance, for the idea that only by accepting and interacting with one another can all people (the nation) prosper. Harmony as the goal—something Hu Jintao and Ji Xianlin, the great sage, could agree on. Timothy Weston teaches in the department of history at the University of Colorado, Boulder. He is a participant in the National Committee on US-China Relations' Public Intellectuals Program and author of The Power of Position: Beijing University, Intellectuals, and Chinese Political Culture, 1898-1929 (UC Press, 2004). Thanks. This is a great article. I don't why there're some Chinese question about Xin's credential as guoxuedashi. It's amazing that he was the first person to translate ramayana in China. This article is right on. I think Dr. Ji personifies the ideal scholar that is central to the Chinese culture. We pride ourselves on being a culture of ideal scholars. The urgent need to survive and succeed monetarily that is present in modern China has all be demolished scholarship as a viable option for the Chinese student.